Werde die ganze zeit vom Server runter gekickt wegen zu hohen Ping, aber mein Test sagt 11ms also 11er Ping da kann nur mit denn Server was nicht stimmen. Hi, Ich Bin ein Deutscher Battlefield Hardline Player. 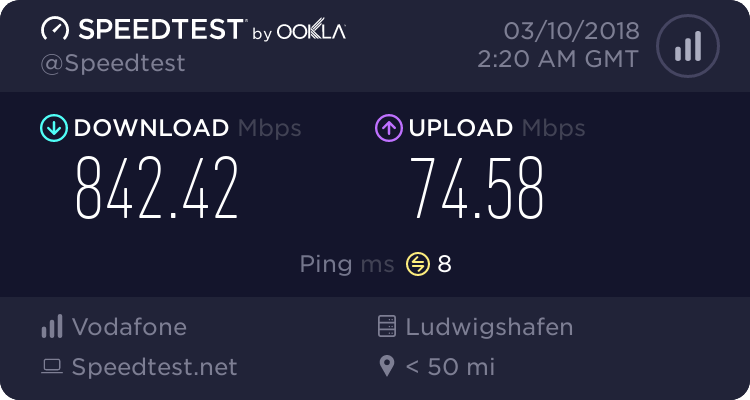 Komischerweise aber bei mir, Speedtest sagt 11ms ich guck immer sofort. und woher willst du bitte wissen wie es bei 300 anderen ist? Also das kann definitiv nicht bei uns liegen sonst wäre es ein Massenproblem. Für Pingprobleme gibt es verschiedene Ursachen. Das Spiel könnte aufgrund irgend eines Leistungsproblems bei deinem PC's einen hohen Ping haben. Das Routing deines Anbieters macht Probleme. Starte mal deine Internet Box neu. Could you possibly post traceroute to PB servers? It would help us debug your issue. Perhaps your ISP's routings are for some reason bad. Type in tracert 94.236.97.18 and post us back what you got returned on screen. It's IP address BFH.EXE connected to when I joined PB # 3. It should show where the delays happen. Do you have similar issues with other BFH servers? Just try entering random empty servers and check if you have. Hab ich 1000 mal aber naja egal, ist halt nur komisch das ich laut server ein hohen ping habe der Speedtest aber sagt das er niedrig ist. ist auch egal hoffe einfach mal dass das sich nicht wiederholt. Speedtest und Server ist auch was anderes. Jeder Server hat eine IP. Um zu dieser IP zu kommen gibt es unterschiedliche Wege. Hier kann es vorkommen dass z.b. dein Anbieter zu einer gewissen Uhrzeit eine hohe Auslastung auf der Route nach Frankfurt hat und daher dein Ping hoch geht. Each server has its own IP, could be accessed via different routes and so on. Speedtest is not a sufficient meter for evaluation of quality. Post the results of the traceroute. It should show exactly where the holdup (s) happen. Traceroute command shows delays between nodes. Oh, btw. In case your ISP or owner of the network you connect from, does some heavy-duty traffic filtering, it could cause all sorts of unfunny delays, because processing packets takes some time. Simple traffic bandwith test by Speedtest, which uses TCP/IP and common web port could simply be ignored by traffic filters.. but UDP traffic on non-standard ports (which games tend to use) could be filtered and delayed. If turns out your traceroute shows nothing, we can also specify it to use UDP protocol. Just complaining does not solve your problem. You have to participate. /PS. I hope to hell you understand my English or browser translates it to sufficiently understandable German. The post was edited 3 times, last by Unit-RX400 ( Apr 10th 2018 ). I have this same issue. No idea why it's happening. 400 ping on a german server when it should actually be 200. Happens on all the PB servers.